The smoking of opium became a threat to the economy of the Chinese Empire and so the Chinese Emperor prohibited all trade in opium in 1729. During the same period the British occupied northern India with its poppy fields. Despite the prohibition the English East India Company exported large quantities of opium to China and by 1835 the export had reached nearly 2 000 tons of opium a annually. 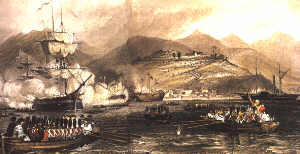 A painting of the attack on China by the English fleet at Dinghai in 1840. The Chinese authorities were not pleased with the situation and chose to solve the problem with force. The Chinese captured and destroyed over 250 tons of opium. The English, in their turn, were not pleased and this led to the First Opium War in 1839. Since England was victorious, the yearly export of opium to China increased and by 1850 more than 3 000 tons were being exported annually. The displeasure of the Chinese led to another Opium War (1856–1858) and, this time too, it resulted in an English victory. The opium trade continued and England forced China to legalise the trading of opium. This went on up to 1906 when the English merchants were forced to stop their opium business in China as a result of pressure from the USA.